Friends upload a video of their annual gettogether - which is a little more extreme than most reunions. 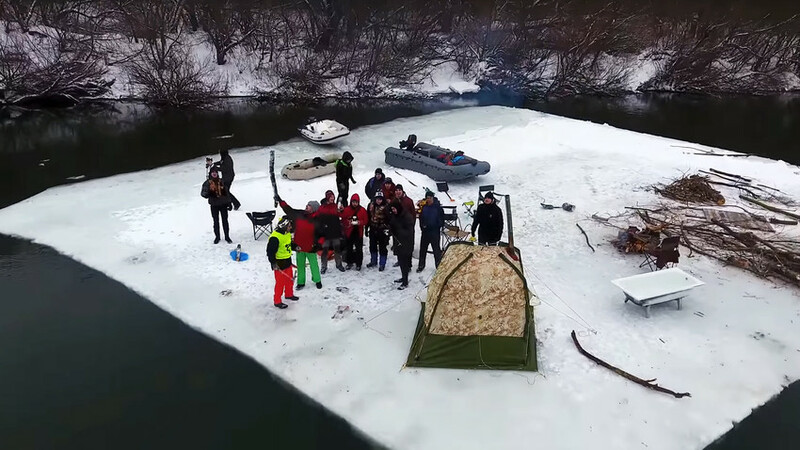 A group of young Russian men cut a huge hunk of ice from the River Don and used it as a makeshift raft. Not only this, but they transformed it into a party zone, complete with a campfire...and bath. One of the revellers, Bogdan Korzhenevsky, says he and his 15 friends meet for the ritual every year. Footage shows them cutting the ice with chainsaws - this year two broke - before making a fire and heating water for the bath. They also enjoy some wakeboarding behind a boat. Korzhenevsky says the picnic lasts an entire day, during which the ice usually breaks up into several parts - but this doesn’t stop the party. “People say we're a bad example for the youth. This is true. But at the same time, personally, I was inspired by some videos on sports, tourism, and other activities. So it is more a matter of perception. If you mindlessly repeat things, it can end badly, but if you find some inspiration in this, go away from a computer, and leave the house, it's fine,” he said.